So, if we’re being honest, and obviously we are- I had a rough week. Nothing serious, just too little time, too little sleep, too much cold not going away. I thought to myself about how I’m behind and hadn’t prepared anything for Simplify Sunday. I thought, I am almost done with the closets! I’ll just finish that, it will be so easy. Ah hahahahaha. First I opened the guest closet, which was all done except for the Christmas box. I had told myself that I didn’t need to go through that, since I use it all. That is only sort of true. The worst kind of lies are the kind you tell yourselves, remember that! 🙂 I opened the box. There are two people in my household, and two dogs. We need four stockings, and that’s if I’m being generous because I’m pretty sure not everyone has stockings for their pets… uhh. Putting that aside, okay, I needed to get rid of four extra stockings. I also got rid of decorations and ornaments I don’t actually like or couldn’t remember where I got them. I like these things for the memories behind them, so that was a good decision maker for me. Once that was done, I went to the downstairs closet. I couldn’t find much to get rid of, mostly just folded some blankets. THEN I realized that my safe aka filing cabinet is in the bottom of the closet. I needed to catch up on filing, and then go through everything and purge what was out of date or garbage. Everything on the floor in the picture above was shredded if needed, and recycled. I absolutely detest going through paperwork. After that I was feeling quite pleased with myself, so I rode that high and emptied out the shredder (involves cleaning the floor because I ALWAYS spill it all over the country) and did the ironing (ironing side note- J asked me yesterday why there is a permanent basket of laundry on top of the dryer. I was not pleased with this question and decided it was clearly time to do the ironing…). I finished up by quickly going through everything that has already been done and making sure no new garbage had snuck back in. So much for my quick minimalizing! Total donated this week: one large kitchen bag equaling $42. Recycled a huge stack of papers and got my files organized. Got several dumb chores done. Feeling pretty good! « Taking the Bloglovin Plunge! 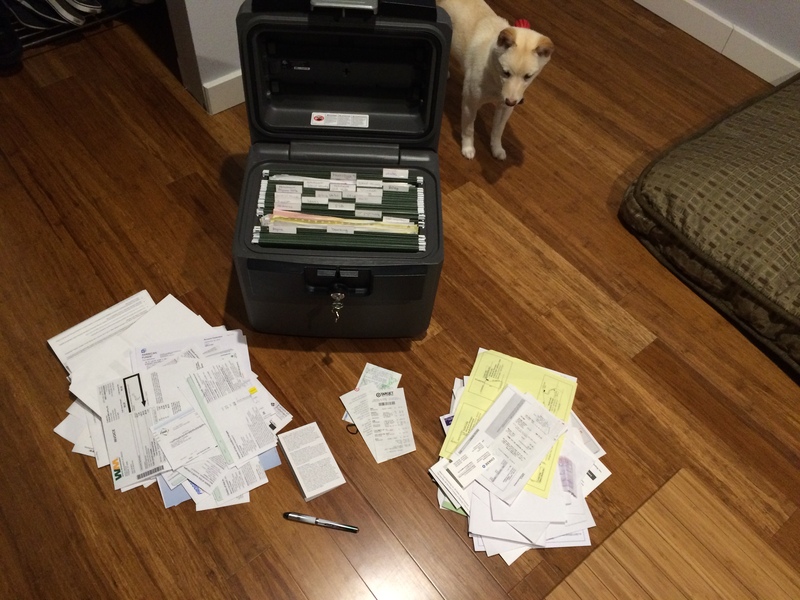 That dog looks impressed with your filing. I’m guessing he/she didn’t help. If by helped you mean “helped”, she sure did. She started the shredding process on quite a few papers, which might have been helpful if I wasn’t worried about her choking on paper. She is the craziest puppy!! Mostly she whined that she was dying of boredom. Hahaha! Paper shredder! I love it! She’s adorable. Sometimes you just have to really reach for the positive, lol! Thanks, I love her even though she’s a handful. Good job! I need to purge too!! Oh to actually get the TIME to do anything though!!!! Exactly. I’m liking my Simplify Sundays for that reason- it makes me actually make the time to do something. Uhhhhhh we still have yours. It may or may not say “jill” or “riley” on it… But those are both free for your use!! I’m just so impressed that you iron, period! That’s one of the many elements of adulthood I have yet to accomplish. Thanks! That’s what my husband should be saying! Chores always feel good at the end! At least they have that going for them. Well, truthfully that’s not what I do 🙂 I set a guideline for myself that I have to post about it on Sundays, but I can actually do it at anytime during the week. That way I know that I have to get it done or I won’t have a Simplify Sunday post and I’ll look silly. However, I can still do it whenever I have time. Ugh! Paperwork! The bane of my existence! You should come see me and my 8 boxes that need to be sorted! Dooooooo it. You’ll feel so much better when it’s done. I sure did. Now I don’t have to shudder every time I open that closet and see the mound of things to be filed.